Archaeologists from the University of Mainz have discovered the first Roman military camp from the time of Julius Caesar on German soil. Situated in a corn field 30 km (20 miles) southeast of Trier, near the small town of Hermeskeil, this camp had a size of 26 hectares, enough to shelter 5,000 to 10,000 soldiers. Built in trapezoid form, it enclosed its own spring to provide the Romans with a secure source of water. No more than 5 km (3 miles) from the camp, there are remains of a settlement of the Celtic Treveri, which was protected by a Celtic fort, the so-called Hunnenring (Huns’ Ring) near Otzenhausen. This fortification, as has long been known, was abandoned in the first century BCE. Part of the original Roman camp wall is still preserved in a piece of forest bordering the corn field. The rest has been plowed over so many times that it could not be discerned by untrained eyes. Inside the camp, excavators discovered pot sherds, late-republican coins, and a hand mill, which legionaries used to grind their daily ration of grain in order to prepare the staple of Roman diet, a kind of gruel named puls. The most important discovery, however, are 70 rusty, 1-inch long, umbrella-shaped hobnails from the Roman legionaries’ boots. As one of the excavators, Dr. Sabine Hornung from the University of Mainz, explains, the length and shape of these hobnails, which prevented the Romans from slipping on the muddy ground, allow experts to date them to the Caesarian period. A recent article in the German Süddeutsche Zeitung (link) offers pictures of the hobnails and of the excavation site. Archaeolog ist Michael Hoff (University of Nebraska), who gave a lecture at Willamette a few years ago, and his team have now uncovered about 50% of a gigantic Roman mosaic from the 4th century CE. 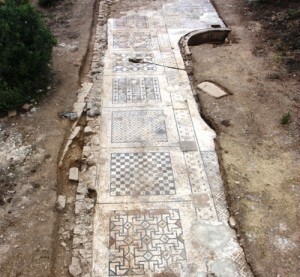 The mosaic once formed a kind of stone carpet around a large, open-air pool in a Roman bath complex in Antiochia ad Cragum. Today a part of Turkey, this area on the margins of the Roman Empire, known as Rough Cilicia, has always been considered as only marginally Romanized. In fact, for centuries its rocky coast served as a perfect hideout for pirates. The discovery of this lavish mosaic may lead scholars to reconsider long-held ideas about the area’s remoteness and lack of civilization. The Body Beautiful in Ancient Greece: Greek and Roman Artworks Travel to Oregon! Welcome old and new! I hope that your summers were fantastic. This is the first blog post of the semester and it won’t be the last. Check us out for cool facts, conference info, and general interest in the study of Classics. Check out the World Languages Studio in the new Learning Commons! The Language Learning Center has moved into it’s new studio on the first floor of Ford along with other parts of the Learning Commons such as the Writing Center and the Learning Center. The Great Hearth is a great place to study classical languages as well as meet tutors and get help with your essays. We also have a ton of great software and online resources on our website and in our computer lab that is available for you all. Finally, the Classics Club has fallen into disrepair which is a truly sad event. There are a great many things that could be facilitated through the Club and we are looking for people to take up the Leadership Opportunities that are available. Contact Soren at sunderda@willamette.edu if you are interested in the club or have some ideas as to what the club might do.